Pastry pro Arlene Lott’s how-to and tips will have you creating your own custom toppers from now on. Think you can’t make a pie-topper with cutouts, flowers and... a 3D bird?? We were with you, before this video. We went to pastry pro Arlene Lott get her perfect pie pastry, and to beg her to teach us how to make this gorgeous thing! Doubt all you want, but once you watch, we defy you think anything less than, “woah, I want to do this right now.” This retro, tattoo-inspired apple pie is going to wow your family and friends, but you’re probably going to try it just because it looks hella fun. Watch Arlene’s detailed instructions here, then get her pie crust recipe below, complete with her secret-till-now tips for perfection. With a long piece of the reserved excess dough, use a paring knife to cut out a ribbon shape and set aside. Continue using a paring knife to cut out the letters in P I E. Brush cream on the back of each letter and place in the middle of the ribbon. Set aside. Flour your surface and roll out the 2nd pie dough. Turn a 9.5 inch pie plate upside down and trace over the rolled out dough. Using a cookie cutter, cut out 1 heart shape and set aside. Using the same heart shape trace around the heart so the shape is ½ inch bigger than the cutter. Save excess dough and set aside. Place 2-3 tbsp of dulce de leche in the middle of the smaller heart. Using a small pastry brush, brush the edges of heart and place the large heart over top and seal the edges with a fork. With your reserved, excess rolled out dough, cut out some holes with the small end of a pastry tip. Place these around the border of the heart. Brush the heart with cream and sprinkle with white coarse sugar. Transfer to a sheet tray and place in the fridge to chill while you assemble the rest of the decorations. 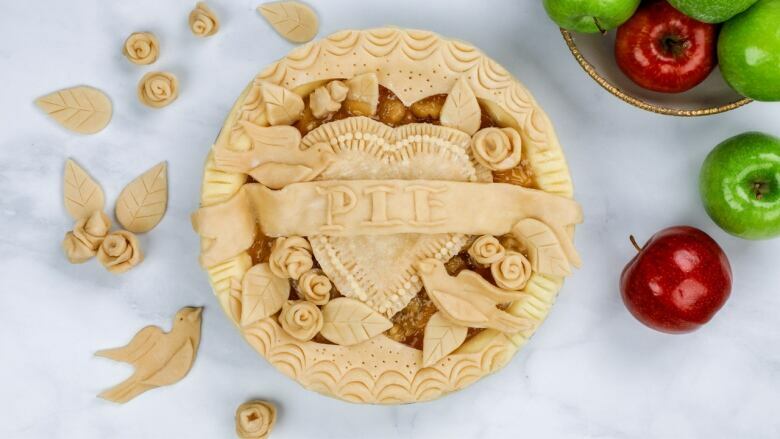 With the two pointed pieces from the excess dough that you used to make the heart shapes, arrange around the top and bottom border of the pie. Set aside. Use a bird cookie cutter to make two birds. Use small excess pieces of dough to add an extra shape and dimension to belly, or wings and a beak. With the a toothpick or skewer, score lines for the wing and tail. Add one indent for the eye. Set aside. Use a leaf cookie cutter to cut out 7 leaves. Use a paring knife to add stem details. Set aside. Place heart in the middle of your filled pie first. Then drape the ribbon across the heart. Place roses, leaves, birds around heart. To finish the details around the border, use a skewer to poke holes, and the edge of a spoon to create half moon details. Spray pie with cream for even distribution and chill in fridge for 30 minutes while you preheat your oven to 350F degrees. Bake pie for 1 hour or until the crust is golden brown.